Our 2019 Aquatic Plant Collection is full with new introductions, beautiful and vibrant varieties, improved information including height and bloom time, Point of Purchase materials and a variety of packaging options to help you grow your business. Folks who understand Pond plants and aquatic gardens were a kind of Secret Society until EZPond entered the picture. We dispel the mystery surrounding aquatic plants by sorting them into four categories, based on the roles they play in any healthy pond or water garden. 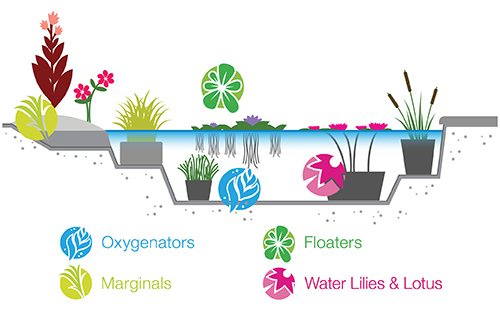 Our new state of the art nursery in southern New Jersey is able to grow a large selection of floaters, marginals, oxygenators, water lilies, and lotus like never before. 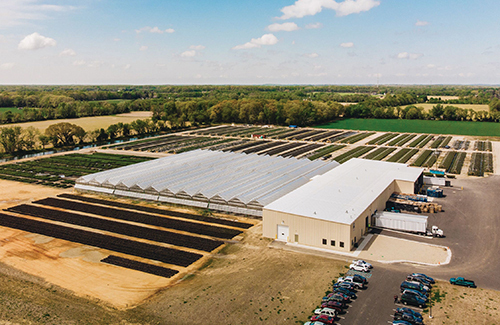 With a combined 60 years of growing experience, this world class facility is fully automated and able to provide the largest selection of quality water plants on the market. Using the color-coded system on our plant tags, any gardener can enjoy the quiet beauty of a plant-filled pond. We offer simple sizing charts and easy depth guides; we even pre-build marginal combinations, making a water garden or pond landscape a snap to take home and enjoy. Below are informative videos. The left column is videos for garden centers, and how to properly display and care for plants at store level. The right column is videos oriented for consumers, and garden centers can use them to educate their customers. Our 2019 Supplemental Catalog is available! We have salesmen in most regions of the country. They would be happy to stop in and visit with you and help you custom build your aquatic plant program. Otherwise, for additional help, our customer service representatives are available Monday through Friday from 9AM to 5PM Eastern time - 1.800.78.TULIP. Request A Catalog - Order a catalog online if you are not on our mailing list.